Great post. Thanksgiving’s ugly history saps it of real meaning. Thanks for writing this. Great post. You should write an article instead of embarrassing yourself with nonsensical profanity. Man, someone takes himself (or herself…wouldn’t want to receive a selfrighteous lecture on gender neutral language) a little too seriously. Take a chill pill and recognize that your lame attempt to distort the suppossed distortion is indicative of an inability to analyze history as it should be….in context. You OBVIOUISLY know little about Native American culture and….ironically have fallen prey to the ***same*** revisionist analysis only in reverse. @$$hole, I’d say. Delete my comment as it does not belong in the free market place of ideas. Hypocrite. I think someone else needs a chill pill, n b open minded to the posabilities of the truth….. I am Native American and I appreciate this article very much! This idiot GovBradfordSaid is the one that is a moron! I think I know a little something about being NA and I choose not to celebrate the holiday any longer! You are too ignorant of the truth and probably too afraid of the truth! Hey moron. Would you prefer that historically accurate version of Thanksgiving? I have another one that begins before this one, and it ends with early colonists digging up fresh Native American graves, to consume the food off of the corpses. I’m sure you’re inclined to deny that one as well, since you’re devoid of verifiable information. Next time to decide to jump on someone for posting the past, make sure you’re not on the wrong side of ALL of the facts. I believe I researched this particular subject quite thoroughly and I had no intention to distort the history. Please notice that I have cited my sources above and links are provided. But if you feel that my analysis is off, would you be kind enough to offer a substantial argument rather than spew out profanity and resort to ad hominem attacks? And yes, I am very ugly. Beware. When Squanto was taken to England, what happened when he got there? How did Squanto escape slavery in Spain? So now what is to be done!? I try telling the children to be thankful of what we have now (family, friends, etc) and not to forget out the past. In the last paragraph of this post, I mentioned that I didn’t write this post to offend anyone or say we shouldn’t celebrate “Thanksgiving.” We can create our own meaning of the holiday and learn about being grateful. At the same time, I believe we need to acknowledge the history and understand that this land was not simply handed over by the Natives (as others would like us to think). There was a lot of bloodshed, racism, and ethnocentricism. All I’m saying is that we have to stop omitting things from our history for the sake of over-glorifying European colonialism. Our schools and educational systems should be teaching history accurately. We should never forget an entire race of people, especially when they lived here before us. We also need to detach ourselves from the excessive amount of greed and capitalism that revolves around our holidays. We benefit more when we emphasis on the MEANING rather than on the superficial reasons. Finally got a chance to finish reading. I want to look for “Lies My Teacher Told Me.” Maybe it will play into some unschooling ‘curriculum’ in our house. Very informative. And thank you for writing this. I always have a strong sense of unease around this time of year. I was horrified by the religious overtones of massacre. Sounds too familiar these days. A country founded on terrorism, some would say. . . Not to open a can of worms. Just a stray thought. Thank you for opening my eyes to a part of history most would rather not remember. America may be the home of the brave, but in this light it is the home of the morally despicable. What they are doing in Iraq and Palestine turns my stomach, honestly. Thanks to the link, I’ve come to this post belatedly though admiringly. Native massacres were followed historically by reservations and forced assimilation, that has led to anomic cultures, and gambling, and illegal or quasi-illegal cigarette trading as major professions. In Canada, health statistics for “Native Canadians” are closer to those of the 3rd world than to those of the rest of Canada, and we seem to have a penchant for returning them to the same decrepid housing on the same remote reserve that floods them out each winter. Most advanced history teaching is about unteaching what was learned in pre-university and even undergrad classes. Hello, I am very interested in this history account and would not doubt it to be true. But, I was wondering, what sources besides the blog website do you have? I don’t know that I want to spread this story as the truth without having facts, and since so many of the stories I’ve found leave out genocide, the Pequot massacre, and the true story of Squanto, I was wondering where one might find for facts about these events/history. Thank you! Thanks for your comment! My sources are all linked above. Most of it comes from James W. Loewen’s book, “Lies My Teacher Told Me.” Click on the bold-faced words in the post and it will link you to the other sources (which also contain citations). I would like to say that celebrating fertility during it’s highest peek at the beginning of the spring season and representing the celebration with a bunny is far from unclean. I mean really, one bunny family can create a population :). Pagan celebrations have everything to do with the wonderful changes our earthly seasons bring us and nothing to do with anything “unclean”. Just like other cultures, religions, and people that have been thought of as less than by the dominant group, paganism has been falsified and misrepresented. In the article a reference is made that the colonists thought the Native Americans to be heathens. But that is light years away from the truth of the Native Americans and so are the misconceptions of paganism brought to us by, again, capitalism and ethnocentrism. I am pagan and I live spiritually connected to the earth. My family and I live peacefully, we love dearly, and we harm none. As for Thanksgiving, the truth of it is horrifying and should not be ignored. Everyone deserves to be represented accurately. This is the most intelligent, well written piece I have seen yet, discussing the misrepresentations of Native Americans in U.S. history. Without the truth — THE WHOLE TRUTH — of the Native Americans, the African Americans, the Mexicans & the Europeans, the history being taught in our schools is just a fairytale. Thank you for illustrating this point so well. America needs the education, my wife just found out about Thanksgiving. It is not being “insensitive” to present the truth straight with no chaser. The only people who will be “upset” are the ones who who are comfortable with the lie and the glarmourizing of europeans as good christian pilgrims when that was not the truth at all. How can I share this…can I share this on my facebook? I am so glad I found your website. I was looking for the TRUTH about Thanksgiving! I had briefly heard and anthropologist speaking on this issue and I agree, we as Americans seem to only want to believe that we are better than everyone. We seem to hold ourselv es to a standard that we can’t keep. Shame on us for Not telling the truth!!! Thank You for doing so!! Thanks for sharing this information. Over the course of my life, I have found many truths have intentionally been left out or omitted for our written & oral history. We have adopted traditions without relevant knowledge. I am now actively reassessing EVERYTHING I have been taught and belief. I think this is the best post I’ve seen. I think you did a remarkable job. This country needs more truthers. I’m sick of the lies and cover-ups. Thank you. I copied the url and posted it on my Facebook. I should’ve asked for permission first I guess. My apologies. If it’s not okay let me know and I will remove it. Well..i do believe on these facts and i quite enjoy the article you wrote.Thanks for sharing this inspiring information to the world.They either agree or disagree but, thats their decision. But I still try to celebrate Thanksgiving in my own way, but giving thanks to God for what I have, and for the bountiful beauty there still exists in the world. Happy Thanksgiving! Of note, smallpox did not evolve from cowpox. Cowpox was, in fact, used as a vaccine for smallpox, as having the milder form of pox common to milk maids prevented the more deadly smallpox. The word vaccine is derived from the base Latin for cow because this was the first preventive innoculation ever used by established medical doctors to stop the spread of disease! A wonderful post! and very well researched. Our family no longer celebrates this holiday, hence why I am on the internet today instead of baking some Thanksgiving feast. We’ve decided not to acknowledge Thanksgiving because we want to lead our children by example instead of just words. It is a holiday born out of atrocity! Any Goddamn idiot debating the TRuTH of this eloqvent and thoughtfully researched article will burn in hell. THANKS A LOT BROKEN MYSTIC FOR POSTING THIS ARTICLE ABOUT THANKSGIVING!!. Most people have been blinded by books and adopted traditions without relevant knowledge…Everyone knows the following sentence” History is written by the winners “…..well nothing did change over the centuries. The English and the other Europeans did horrible things when they tried to colonize the whole world. The American continent ,Africa, Oceania and Asia. Despicable horrors have been carried out in the name of religion. Especially christianity , but also Islam and Judaim. Millions have died, and are still dying because the misguiding, ignorance, the LIES of a race over the other one has not not relenting in their bloody thirst to rule over. That’ s funny how come in the name of religion people can be lie to justify their crime and turn them into profit !!! BY THE WAY THEIR ONLY ONE RACE SINCE WE ARE ALL MIX AT SOME POINT…AND RELIGION IS JUST AN INTERPRETATION FROM ONE TO ANOTHER…JUST AN OTHER BRAINSHWASH OVER AN OTHER ONE SINCE THEY ARE SIMILAR ..SEE OLD AND NEW TESTAMENT.. THANKS AGAIN BROKEN MYSTIC !! I took a course at the university on Native Americans some years ago and I can recall most of what you posted. Great job on getting the truth out. If we picked up some GOOD books from time to time or took more course we’d be a much more intelligent population. First i would like to thank Broken Mystic to post this valuable information. I am also more pleased and surprised that so many people have assimilated this so truth information. This is how we see that there is some progress in people’s understanding when it comes to this country and truths, not all is lost. Although i was very pleased to read this information and foward it to some of my relatives, i got a little concerned; and that was when the author of the article said that he was not implying that we should not be celebrating Thanksgivin. His comment was contradicting to the article. First of all we should give thanks to the Most High for all we have EVERY SINGLE DAY. Second of all, if somebody is telling me a horrible truth about something i am celebrating, i should not even consider celebrating that anymore, for me that is common sense. Again you don’t need to wait until a particular day in November to give thanks for all you have and to gather with family, you can do that year round. Anyways, I am pleased that more people are knowing this truths and i just hope that more people are open to hear more other tuths. I came across this page by trying to explain to my ex-husband what Thanksgiving was really about. He did not believe me. I am a California Native and White. My Father side of the family is not Native and I am amazed how many people still don’t reconize the truth. Including my Dad’s side of the family. My son came home from school with a pligram hat on celebrating this day. It was like fire lit up inside me. I believe to make our wrongs what is right, to heal our country we need to begin with this truth in our history. The suffering still is going on that is going unoticed and covered up. This is not just in our history but is in our present. I can only Pray that the healing begins someday, but for now there lives a uneasiness in my spirit about this. I will continue to learn about my people that was taken away before my time and continue to teach my Son so the truth can always be told. Thank You for your reseach….. Nothing like telling the truth. I am going to be sharing this with my children this year before heading out to spend time with family on Thanksgiving. I will explain that I am going to visit family but do not condone the actions of the European people. I do not represent the “American” version…it is embarressing to realize that I have some freedoms because of the sacrafice of so many Natives. now whats crazy is tht everybody already know’s what happend to us natives.the truth about thanksgiving shouldnt come as any surprise thats how i feel about it.I do like this post and respect it because even though i do have a spanish last name i am mexican indian n does hurt to know that the education system is feeding lies to kids wen they are so fast to speak about slavery and slave ships.Why cant they speak the truth about my people or how most native tongue is extinct? any who thank you for the post.I hope people will seek the truth’s about every holiday not just “Thanksgiving” peace. The Feast of 1621 was shared celebration between THE MAYFLOWER PILGRIMS & THE WAMPANOAG INDIANS. No one killed anyone else. Our modern Thanksgiving is about JUST those 2 groups, NOT previous or later arriving colonists & their violent acts. The Indians saved Pilgrim lives w/ farming skills. The Pilgrims saved Indian lives w/scientific medical skills. The Pilgrims shared their metal tools & muskets & when asked by Chief Massasoit, agreed to fight on the side of the Wampanoag in their battles against other Indian tribes, NOT European colonists. Harvest Feasts had been going on all over the globe for centuries. As was the custom, a Prayer of THANKS before the meal was offered. Both groups contributed the food. Games, sport & dining was shared for 3 days. HUMAN, not only “white” history is filled w/violence & pain. However, what is now referred to as THE FIRST THANKSGIVING was a BRIGHT (if brief) MOMENT OF PEACE & BROTHERHOOD; an excellent example of people of different cultures working together for their mutual benefit. The peace didn’t last; so does that mean we DON’T celebrate it’s initial existence!? THERE IS NOTHING . . . NOTHING IN THE WAMPANOAG/PILGRIM AUTUMN 1621 STORY WHICH DESERVES DENIGRATION & SHAMING. Why can’t you look for the GOOD in human beings!? Peace ALL. Happy Thanksgiving! Follow the link to my new blog and read the additional readings I provided at the bottom. That will clear up your misunderstandings. Also, please stop using the “colorblind” argument by saying “we’re all human beings.” Yes, we know we are all human, but the world doesn’t operate like that. There are oppressive social, economic, and racial hierarchies that work to treat people differently based on perceived differences. You’re suggesting that I don’t appreciate the good things in people and life in general – and you make this claim confidently even if you don’t know who I am. Also, you want to derail this conversation away from the actual events itself: genocide against Native Americans. You fail to see how erasure of an entire group results in systematic racism. So, let me reverse it on you and ask, “Why can’t you look at the terrible things other human beings have done and how their actions still impact and affect other human beings today?” Surely, you are aware of the current struggles indigenous people face, right? If you care so much about other people, then stand up for them. Stand up against the racist system that grossly distorts or erases the truth from history textbooks. Doesn’t that upset you? The truth is being share and I believe more and more people are waking up to the truth. Thank you for doing your part in imparting knowledge. The lies can no longer be sustained in the face of higher consciousness. Wooooow I’m so glad that you posted this and took time out to really break down the true meaning of THANKSGIVING thank you for really opening my eyes on this horrific tragedy that took place many years ago. This truth is not surprising at all to me. And, it is partly why I do not celebrate thanksgiving. For me, the orgin, purpose or truth behind such things is more important than the thing, event, holiday, etc. We should all consider what it means to the Natives as we continue to celebrate such atrocities today. As the off spring of generations of slaves, I certainly understand how they feel. Certain people scared of the truth , it’s just the weakness in them they weak . I read I enjoy , I pray . Thanks. Admin comment: Why do you keep posting the same comment? You try to romanticize genocide and then say “Happy Thanksgiving”? Stop being condescending. You know what you’re doing. The Thanksgiving Holiday is not to be celebrated! Its ok to hate the truth at times. European holidays are everyone elses horror-days. I couldn’t agree with any article more than I do this article. Being a descendant of the native people, as well as Black Africans, I find it ONLY the work/grace/mercy of the almighty God that I am not a devout racist against Europeans. I DO, however, have an extreme difficulty with trusting them…with great and growing reason, or should I say, due to their current and past actions. Great beacon of truth is this article! I don’t really get it. Europeans came to America to find new opportunity. They encountered the native people living there, who had inferior technology and lacked immunity to certain diseases. The colonists more or less wiped out these native people. It was at times brutal. What were the colonists supposed to do upon meeting the native people? Say, “oops, someone already lives here” and go back across the Atlantic? How was the clash between the colonists and native peoples anything other than survival of the fittest? The Europeans came with their superior weapons and diseases that killed the native people. They won. One of the real myths that needs to be dispelled is that of the noble savage. This idyllic romanticizing of the native people of America is pure fantasy. They were people. They were no more or less violent than the Europeans were. They just lost. Maybe it’s unfair, but it’s what happened, and who says life is fair, anyway? Wow. So, you’re basically saying, “Hey, the European colonialists brutally massacred and wiped out Native peoples, but that’s life!” Implying that Native Americans must disappear and that European colonialists were the rightful inheritors of indigenous land *is* the logic of genocide. 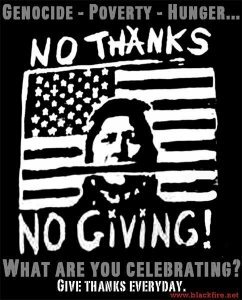 I have never once in my 53 Thanksgivings heard anyone say anything about giving thanks to what was done to the Native Americans (my aunt and grandmother are Native American). It is no more than a harvest festival, a time to come together and give thanks, period. I see. So, if your history lessons never romanticized European colonialists and American Indian genocide, does that mean it doesn’t happen? Aside from my personal experiences with this kind of racist socialization in elementary school, did you miss the references I made in this post? Tellok, I find that impossible. To be a teacher and not even know what you’re teaching. You know darn well what you taught and had the kids make during thanksgiving. I humbly respect your insight, somewhat fact base, part truth of what you shared. Its always said, be very careful when one takes on the responsibility of sharing knowledge. Allow me to share with you a vital part of history racist European invaders, and Mongolians(your so-called Natives, NOT) purposely left out, to once again, attempt to write black people out of history. Long before the Mongolians(Indians) arrived in America(MUU)there were a people here called, The Washitaw Muurs. The FACT is, The Washitaw Muurs, called The Mound Builders, are still here in America. Archeologist, have found artifacts which date back thousands of years before the Mongolians arrived. DNA(Fact Based)shows BLACK PEOPLE were living in America(MUU)under constructed, organized, civilized lives. The Indians(Mongolians)did to the Washita Muurs what the Europeans did to them. The Indians LIE about them being natives of America(MUU), they are NOT Natives. How could the Indians be called Natives when a people were already living here when they arrives? Hello friend, Great article you’ve written and put out here! Thanks for doing so! The entire World needs to be taught True history! My ancestry goes back to the Eastern Pequot…..not sure about the massacre happening on CT though, as I was born and raised on Rhode Island & grew up mere miles from what is known as, “The Great Swamp”! Google….”The Great Swamp Massacre” That was on Rhode Island, not CT….regardless of exact location, thanks much for putting this article up for All who have eyes to see! there are some good and truthful things said here. however, the article seems to suggest that “many” Pilgrims delighted in the plight of the Native Americans, and this is simply conjecture. because a handful of European settlers chose to be prejudice and hate certain groups of people because of their ethnicity doesn’t mean the majority did so. yes, our American history books are flawed, along with our dismal Socialized school system. i was born in 1965 and i remember being taught that people thought Earth was flat prior to the 1500’s; however, later in life i discovered that even in the book of Isaiah, which was written nearly two millennia BC, it was known by humankind that the Earth is round (Isa 40:21-22). further, the fall harvest festival of Thanksgiving actually dates back to ancient man, also Biblically documented as being the time of the Feast of Tabernacles and had been carried down throughout time by many cultures, especially within various Puritans and Pilgrims who also observed various Biblical appointed holy times. while evil exists within ALL cultures of humans (perhaps within some more than others) we need to be careful to not pull specific examples of such evil and apply them to ALL people within that culture. there have been many European and other settlers of varied cultures who were NOT prejudice against the Native Americans and who despise the actions of those who wantonly murder others. for example, i am greatly opposed to the continued illegal wars (terror, drugs, poverty, etc.) which this Neo-Amerikan gov’t has engaged in for decades. but to read this article, i might imagine one likewise suggesting that ALL Americans are evil simply because of such actions many of us loathe. RUBBISH! greed is found within human beings, not “Capitalism”. if you have done your homework in uncovering such lies being taught within the Socialized education system, you would know about the erroneous teachings regarding “Capitalism”, which merely means the “free market”. Neo-Amerika is NOT a Capitalistic nation — it is a Socialist / Fascist / Corporatist nation. gov’t at all levels has interfered with the free market for arguably a century, creating manipulated markets whereby the legal corporate structure created by gov’t is given unfair advantages in an un-level marketplace. it can be said that the only free market remaining in so called “America” is the “black market” — because one can negotiate a deal on moonshine without interference from the gov’t (unless one gets caught violating a law which usurps one’s individual liberty). i would therefore suggest getting your facts straight prior to making claims such as the majority of American settlers took pleasure in the plight of our Native American cousins, as a result of the actions of a few. It has always been the same thru time. The victorious write history. Right/wrong has no play in who keeps the records. As parents it is our job to keep the truth available to our children and show them the truth as we can best learn it. Mvto pronounced (Ma-do) means (Thank you in Muskogee) for the post. I appreciate the facts or brain washing anytime. That Gov. Bradford is a basket case and should be institutionalize. I have a annual bonfire on the night of Halloween to celebrate Native American Brothers and Sisters. It for me is a night of strong heartfelt memories of the facts about what has taken place in the ugly mean history of terrorism in the USA. I should do similar actives for thanksgiving and christmas as well. I also celebrates the last night of my ancestors removal form Alabama by the supremacists. An Estimated 18,000,000 Native Americans were killed so all the fat, selfish, narrow minded, earth eating Invaders can have what they have today. Most people never think about how NA’s where treated. The sadist part is that there are too many people walking around us today that would choose to do it all over again. As someone noted above, this “history” is as selective and revisionist as any of the worst written in favor of European settlement. The natives of the Americas were, to European eyes at that time, backwards and savage. They fought incessant, sometimes genocidal wars against each other (re: the Mohicans, Aztecs vs. Mayans), they engaged in child and adult sacrifice on a scale never seen anywhere in the world (80,000 killed in one day at the hellish Tenochititlan in present day Mexico, and a minimum of dozens killed almost daily), and of course the level of technological and cultural civilization was on a par with about 1000 BC in the eastern hemisphere, from Japan to Spain. The native Americans wiped out the first European settlement in Virginia, Sir Walter Raleigh’s band, and constantly harassed and attacked settlements from Jamestown to Plymouth Rock. As I said, the native tribes were, by and large, warlike and often dominated by a warrior caste. These people were not the innocent paragons of virtue as has been presented. Let us not forget what European settlement brought with it – a 2500 year leap forward in technology and civilization, and a religion based not on animism and frequent human sacrifice, but based on love of a single creator God who loves His creatures. In fact, all this romanticization of native peoples was rare outside a tiny fringe until leftists in academia embraced it as a cause celebre in the 1930s (with funding from the Comintern) and began re-writing history. But, I’ll play your game. What would you like to have taught? That European colonization was a disaster for native peoples? Well, check, that view now predominates in virtually all public school textbooks. That the native people were peaceful virgins at one with nature? Again, that’s what’s being taught, although it’s highly inaccurate. I think you need to unplug from the TV and internet and actually see what is being written in textbooks and other instructional material – there are entire departments at most universities in this country now dedicated to “native American studies.” What more would you like? Groveling in sackcloth and ashes, lamenting the terrible atrocities committed by those of European descent hundreds of years ago? Or is it something else? Or is it the ubiquitous ‘reparations’………$$$? The ugly picture you paint, so distorted from reality, smacks of bigotry. Hey brokenmissedit, why don’t you answer A. Mack’s post #43? Karina, there’s always something shady done by “people.” Americans are just as good and bad as anybody. But this debunker impulse some people follow to drag Americans through the mud is myth-making just as shoddy as that which they claim to debunk. Great article!Thank you.the same people that first came here destroying our land and tring to kill our kind off are still doing it till this day! !Not only killing off the nitive amerians but realizing that they have made a huge mistake and now killing off their own blood.This is a sad, stupid country in alot of ways because Americans don’t take the time out to research how corrupt there own counrty really is. The Pequots were unfairly blamed for the death of a pirate and slave trader who, along with his crew, had been kicked out of Boston. He and his men were capturing women and children from the Western Niantics, a tributary tribe under the Pequot’s control. The Pequots refused to turn over to the colonists the Niantic warriors who had killed the creep. Then, as your article mentions, a well-respected man was found murdered. Again, the Pequots were blamed. There is evidence that allies of the Narragansett, who were enemies of the Pequot and allies of the English, were responsible. When questioned by the English, the Narragansett supposedly convinced them that the Pequots were responsible. Knowing what I know about human nature (and that includes ALL humans), I suspect the English authorities were looking for an excuse to get rid of the Pequots because they were allied with the Dutch and were in the way of expanding their control of the fur trade. Many of the colonists used Christianity and Calvinist theology as an excuse for their avaricious desires. There are always tares among the wheat, as Jesus said, and there were a lot of tares then as always. Of all the history I’ve been taught and read there is no mention of the people , Red and Black , that were forced into slavery by the Jews.These particular Jews had no genetic link to biblical Jews whatsoever, yet, they are given more credit than ever should be allowed for the founding of this country. They sold to both sides during the Revolutionary War, monopolized commerce, help to spread smallpox to Native Americans so they could acquire land “rights’, were the largest group of smugglers and traders of Black Africans and cheated the Gentile population with high interest rates after they themselves had been given considerations in the areas of finance because of their assumed religious “persecution”. Not to mention they were expelled from every country they ever landed in because of their corrupt practices. This is nothing thats being mde up by this writer.This is all documented by their own historians and scholars. These are only a few of the things they did but it’s enough to make one wonder about the accuracy of any of the history of the United States. “bible’, The Talmud and cried religious persecution whenever they didn’t get their way. They were responsible for helping to spread smallpox to Native Americans in order to gain land “rights’ after their removal, sold supplies to both sides during the Revolutionary War, were the largest traders of African Blacks for the slave trade and monopolized commerce while cheating Gentiles with outrageous interest rates after they themselves had been given special considerations in finances. They were expelled from numerous countries for these very same corrupt practices,yet, I see nothing but how they “helped” to found this nation. This is nothing that is being made up by this writer. This is documented evidence by their own historians and scholars even to this day. Why should they hold any special place in history other than being named the low down criminals they were and are.? In my humble opinion, the Red Man has barely survived genocide at the hands of all europeans coming into contact with them; To ‘blame’ whites, jews or any other group is folly. When I say to folks, its always been about greed, man’s insatiable appetite for MORE, I Often get back on a racial dialogue along these lines: “I’m not an anti-semite but that IS who is in charge of all the money, international banks eyc. They are all jews”. I am Rastafarian and Native American so this is too complex and trying a subject to add to any debate on, so thank for reading my comment, have a great day! I’m a white male who lives in upstate New York at the foothills of the Adirondack Mountains. This area is rich in past Native American culture. It is very hard for me to celebrate the Thanksgiving holiday. Although I feel it is very important to celebrate being thankful for what we have here in the United States, but shouldn’t we be thankful everyday and not just one day in November? I hunt and fish and take only what I am going to eat. For every deer or fish that I kill or catch, I say a prayer for the animal and thank the Natives for showing us how, and God for allowing to have the skills to do so.As Americans why should we live this lie that everything was all good between the Natives and the people who wanted to leave their home country in search of a better life? Why is this taught to us and we know it’s an out right lie. I feel these lies should not be taught to our children as they were taught to me, and let the truth be known. How quickly people forget that the Native American people who want to hold on to their traditional way of life are forced onto reservations, and have the highest level of poverty, alcohol and drug abuse. I try to put myself in their shoes, and wonder what it would be like if people from another country came and took away every thing that I have ever known and loved. With that being said, we are NOT the Roman Empire, but if we continue to act that way, and teach lies to our children, we will fall in a fraction of the time of other empires. Rewrite the history books and TELL THE TRUTH! Great post and accurate as compared to all accounts of the creation of ‘Thanksgiving’ day I’ve seen. To celebrate injustice is barbaric and UN-Godly. It’s not necessary to set aside any particular day to be thankful. But, to celebrate a time in history when millions of people were slaughtered and robbed is an hypocritical act. Not only did the white man destroy Indians with violence, but they also destroyed them by passing along Bubonic Plague knowingly. Thanksgiving day is nothing to be thankful about. WOW! I did a paper over 15 years ago when I was in College. It was about this very same theme. I had to give a presentation on it and many people were not happy. I burned the bridge in Academia as the saying goes. I remember a quote from Abraham Lincoln where he said in reference to Native Americans “they will either be civilized or they will die”. Seeing the recent hoopla over Abraham Lincoln makes me laugh considering his view on Native peoples and blacks. The truth is always better than lies. Thank you! Unfortunately, history is written by the winners of whatever conflict is happening at the time, and the other side of the story is lost to history. I am not an expert on history by a long shot, and I like more ancient history than anything else, but it is awakening to read something in closer history and be reminded of the atrocities humans can inflict on their own kind, and tell myself to learn from past mistakes of my own and of others’ doing. Otherwise we are doomed to repeat them. Many people want to believe and do believe what the school system taught them about the past and conclude it as the truth; but that is only to conclude that ealy white Americans not only spread diseases but also racism. I, a mestizo and a Mex-American, always new the truth in my blood and bones the truth about the American Indians because I have experienced the same racism they experienced from the beginning of the pilgrims arrival. I too was polarized into the white culture of American history and its a disgrace we still continue to lie to our young generations of Americans. God Bless America! I have often wished that Smallpox and genocide would not have wiped out the Native American population, because they had a love for the Earth and the animals in their religions and we would not be dealing with the environmental consequences of our consuming and devastating Corporate culture.